The Flex offense has been around since the 1970's and is a patterned offense featuring passing, screening, ball-reversal, options and counters, and the prototypical "flex cut". This offense is most effective against man-to-man defenses, and has been used by many high school teams. 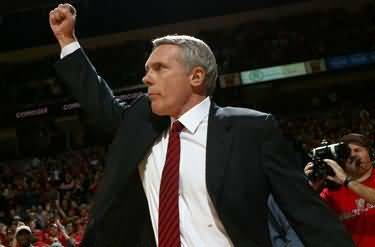 At the collegiate level, Gary Williams at University of Maryland achieved success with the flex offense, winning the 2002 NCAA championship. Most scoring opportunities come off the "flex cut" inside, or a jump-shot from the elbows. Still you can run various options, counters, post plays, etc. Size mis-matches often occur due to the screening and defensive switching. This article describes the basic flex motion and a few options. Advantages of running the Flex offense are that it is a "continuity" or patterned offense, it is somewhat flexible, and it is relatively easy to teach. Disadvantages are it's predictability, and that it can be defended by switching the screens. To effectively run the Flex offense, most coaches will use a few counter plays, which then discount the predictability factor. And if the defense switches screens, you can actually exploit this and take advantage of big-little defensive mis-matches. (Diagrams A - E) In diagram A, O1 passes to O2, while O3 makes the "flex cut" off O5's screen. Depending on how the defense is playing, O3 can cut either over (ball-side) or under (baseline side) the screen. O2 could pass to O3 for the inside shot. If the pass to flex cutter is not there, notice in diagram B that O1 then down-screens for O5. The screener O1 then moves out to the corner (the down-screener always moves out to the corner). Using the down-screen, O5 cuts up to the elbow for the pass and jump-shot. If the elbow pass is not there, O5 steps outside to get the pass from O2. Now in diagram C, O3 screens as O4 makes the flex cut from the opposite side. After the flex cut, we again note in diagram D that O2 down-screens for O3, who cuts to the elbow looking for the pass and jump-shot. Notice how in diagram E we are in the same basic set as in diagram A, and that the pattern has continuity and can repeat from side to side. Basic Motion. The next three diagrams below show the basic motion when the ball is passed into the corner (wing). The passer becomes a screener, making two screens and ending up in the opposite corner. In diagram CP1, O1 passes to O2 in the corner. O1 then screens for the opposite guard O3. If the pass into the post O5 is not there, O3 receives the pass back from O2 (diagram CP2). Meanwhile, O1 down-screens for O4, who cuts up top for the pass from O3. O1 then moves out to the weakside corner. Now notice in diagram CP3 that we are back in the basic Flex motion with O2 making the flex cut over (or under) O5's screen. Give and Go Option. Diagram F shows the pass to the corner and a simple "give and go" cut by O2. If O2 does not receive the pass on the cut, then all perimeter player rotate to fill the spots. O5 screens for O2 cutting to the opposite corner. Diagram G shows quick ball reversal (possibly a skip pass to the opposite guard) and a pass to O2 for the possible 3-point shot in the opposite corner. Notice in diagram G2 the continuity when the ball is passed from corner back out to the guard O1. O2 now makes the familiar flex cut over (or under) O5. Guard-to-guard pass denial... double-screen option. Diagram H shows another option. Here the pass from O1 to O2 is being denied, so the pass goes to O3 in the corner instead. O1 and O2 then set a double-screen for O4, who cuts to the ball-side guard spot as seen in diagram I. The screeners O1 and O2 then rotate into the flex spots as seen in diagram J.
Back-screen option. Diagram J shows a back-screen with the post O5 back-screening for the ball-side guard O4. If none of these options are productive, the pass goes back out to the top and we are in our basic flex set. Corner-to-guard pass denial. If the pass from the corner to the wing is being denied, instead of a back-screen as seen in diagram J, we do the opposite and have O4 (the guard being denied) down-screen for the post O5. O5 pops out on top for the pass from the corner. (Diagrams K - L) Start with O1 on top and the other four players down low (diagram K). O1 dribbles to either side, as the two ball-side teammates (O3 and O5) move opposite and set a double-screen for the opposite post player (O2 in this example). O1 can try to take the defender 1-on-1. A second option seen in diagram L is a pass to O2 coming off the double-screen. After screening, O5 rotates out on top and O3 screens for O4 who cuts to the ball-side block as another option. (Diagrams M - O) If you have a good, strong post player, you'll want to get the ball inside. Size mis-matches often occur with all the screening and switching that goes on. You could feed the post from either the top, or from the corner. In diagram M, the defender is denying the pass from the top. O4 should try to move the defender up the lane a little. Not shown in the diagrams, if O4 goes all the way up to the elbow and is still being denied, there may be an opportunity for the lob pass over the top (from O2 to O4). Diagram M shows how to get the ball inside when the post is fronted being from the top... pass quickly to the corner, while O4 seals the defender outside and receives the curl bounce-pass from the corner for the baseline drop-step and lay-up. Diagram N shows how the post player, who is being well-defended, can skip pass back outside to the opposite wing. Now notice in diagram O that we are back in our basic flex set. From Transition. Diagram TE below shows how we flow into the Flex from transition, after securing a defensive rebound. Our post who does not actually get the rebound (O4 or O5), sprints up the middle and will locate on the ball-side block, the side that our point guard O1 chooses to start on. O1 gets the outlet pass and dribbles middle and then picks a side, either right or left... it's good to vary this, starting sometimes on the right and sometimes on the left. O2 and O3 sprint up the court to the corners. The rebounder trails to the guard spot opposite O1... this could be either on the left or the right, depending which side O1 starts on. 1-4 Low Set Entry. Diagram 14 above shows the 1-4 low set. O1 can pick (dribble toward) either side. The opposite low post O4, cuts up to the opposite guard spot and gets the pass from O1, and we are in our familiar flex set. Diagram 14B shows O4 being denied the pass at the top. O4 back-cuts this for a quick pass and shot. If the pass to O4 is not open, O4 down-screens for O3 (diagram 14C), and O3 moves up top for the pass from O1 (diagram 14D), and we are in the Flex. Dribble-Entry. Here is another option, helpful especially if the guard-to-guard pass and/or the guard-to-corner pass are being denied. O1 simply dribbles to the corner (diagram 14E), while O2 curl cuts around the post O5 to the elbow for a possible pass and jump-shot. Or O1 could pass to O5 in the post. If O2 does not receive the pass at the elbow, he/she moves out on top and could get the pass there from O1. A pass then from O2 to O4 and we are in the Flex set, with O1 ready to make a flex cut over (or under) O5. There are many other options and plays that you can draw up. Players should learn how to back-cut if being aggressively denied the pass. If the guard-to-guard pass on top is being denied, the ball can be dribbled over to that spot, while the player being dribbled at, must back-cut out of the area toward the hoop and fill toward the weakside, while other players then rotate to fill the spots. For example, in diagram N above, if O2 wanted to pass to O5, but O5 was being denied the pass, O2 could dribble to O5's spot, while O5 cuts through to the basket and out to the left corner to take O1's spot. O1 would rotate up to take O2's vacated spot on top (left). Learn to take advantage of size mis-matches in the low post that occur when the defense switches the flex's down-screens. Remember that your best and most frequent scoring options are off the flex cut inside, or the jump-shots at the elbows. Teams that have strong post players will also try to take advantage of mis-matches in the low post, especially at crucial times in the game when you want to get the ball inside or get to the free-throw line. See the Thunder Offense, which is a variation of the Flex offense. To get the rest of the Flex article, including the high-flex offense, get the Playbook download or become a Premium Member. Bob Schlosser Scramble to the Flex Drill from "Comprehensive Guide to the Flex Offense"
Mike Jones: "The DeMatha Flex Offense"